Wetlands are nature’s sponges during hurricanes. Those along the coast slow down storm surges, physically impeding water from sloshing onshore. Freshwater wetlands, lining rivers further inland, soak up torrential rain like a sewer. For the first time, we have a sense of how much property damage these natural habitats can prevent during severe storms like Hurricane Harvey. Coastal wetlands thwarted $625 million worth of property damage during Hurricane Sandy in 2012, according to a study published Thursday in Scientific Reports. 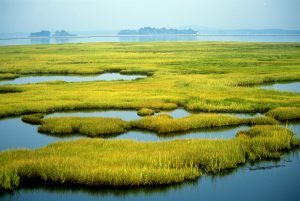 In more than half the zip codes along the East Coast, wetlands helped reduce the cost of damages by 22 percent. Even urbanized New York, where wetlands cover 2 percent of the land, saved about $138 million thanks to wetlands. While the total savings represent just 1 percent of Sandy’s overall cost ($50 billion), wetlands still helped spare hundreds of homes and thousands of miles of roads from more damage. The U.S. has lost more than half of its wetlands since the days of our founding fathers. Still, wetlands could help recoup much more than $625 million in the future, if coastal conservation and restoration efforts remain on track. Narayan, who specializes in coastal engineering, didn’t always feel this way. By nature, he is skeptical of people who claim any single thing, such as wetlands or seawalls, can protect people from flooding because it is such a devastating force. 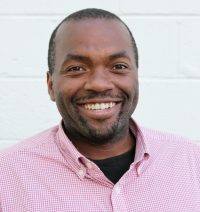 But four years ago, he attended a summit in Santa Barbara, where ecologists, engineers, economists and policymakers were assessing how coastal habitats reduce risks to people and property. 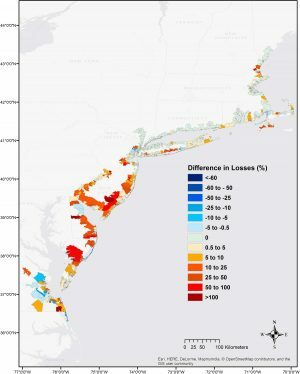 So Narayan and his colleagues used insurance risk models to estimate what would have happened during Hurricane Sandy if all the wetlands on the East Coast had instead been open water. Comparing this scenario to actual damages showed wetlands saved $625 million overall for zip codes stretching from North Carolina to Maine. New York and New Jersey were spared the most damage by wetlands, due primarily to their high property values. But when removing differences in costs of living, wetlands-laden states like Maryland, Delaware and Virginia top the list, with 30 percent reductions in property damage for areas lined with wetlands. Coastal wetlands in these three states also helped save the largest number of roadways — about 833 miles. Overall, more than 1,400 miles of roads and highways were protected by wetlands during Hurricane Sandy. “That kind of information is going to resonate with local agencies,” said Katie Arkema, a Stanford ecologist and lead scientist at the Natural Capital Project. Arkema said one of the study’s strengths was its analysis on how flood benefits influenced individual communities. For instance, Narayan and team found that Hamilton Township in New Jersey would have experienced an 139 percent increase in damages during Sandy, even though the community is 30 miles inland from the Atlantic Ocean, if it hadn’t been for the wetlands that fill many of Hamilton’s neighboring townships. How are these findings playing out with Hurricane Harvey? Arkema said these micro-level benefits come into focus with Hurricane Harvey. In 2013, she and Natural Capital Project conducted a nationwide assessment of how coastal habitats — like wetlands, dunes, reefs and seagrass forests — shield people from storms and sea-level rise. “The Texas coast sort of jumped out at us, especially along the southern coast of Texas, including Corpus Christi and Rockport, where the Hurricane Harvey first hit land,” Arkema said. Those areas are littered with coastal wetlands made of mangrove trees and saltwater marshes, which can decrease the strength of a storm surge as it races toward shore. 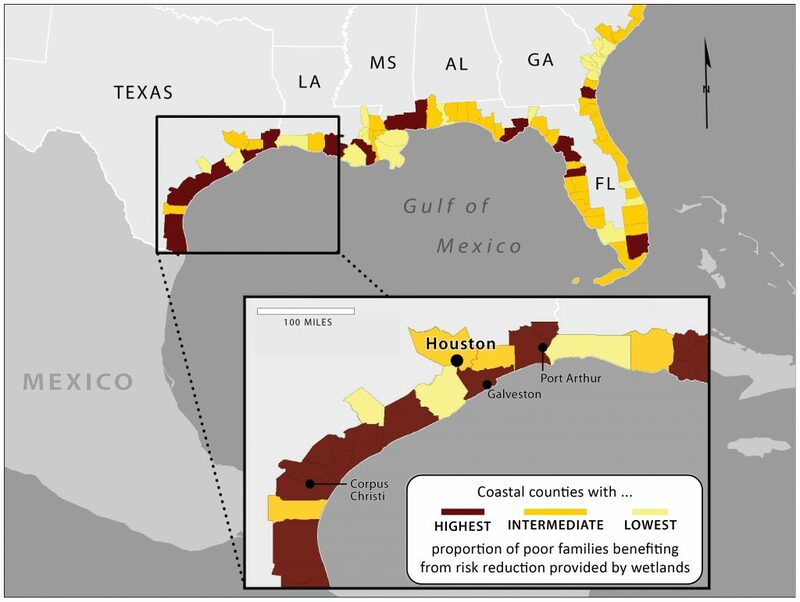 Moreover, their study found natural coastal habitats protect about $2.4 billion worth of property in Texas and thousands of people, many of whom are families living below the poverty line and other disadvantaged communities. Arkema is already looking into the extent to which coastal wetlands blocked storm surges caused by Hurricane Harvey near Corpus Christi. Risk Management Solutions estimates that the economic loss from Hurricane Harvey could balloon to $70 to $90 billion due to wind, storm surge and inland flood damage. Further north, some claimed “Houston’s flooding shows what happens when you ignore science and let developers run rampant” by eliminating wetlands — but that’s wrong. The claim hinges on an assessment that showed Harris County — which includes Houston — lost 29 percent of its freshwater wetlands from 1992 to 2010, mostly due to urban development. Harris County’s freshwater wetlands are inland, which means they’re a sewer for storing downpours and flood waters instead of blocking storm surges at the coast. But the researchers behind the historical assessment said Harris County’s wetlands would not have helped Hurricane Harvey’s massive flooding, anyway. A meteorologist with the Harris County Flood Control District estimates 1 trillion gallons of rain hit the region from Saturday to Tuesday. But the current wetlands plus those lost since 1992 could hold only about 17 billion gallons of water. Think of that the difference in volume as filling a bathtub made for two people with 115 people. Hurricane Harvey serves as a poor gauge for the Houston’s flood control, he said, because no wetlands (nor man-made sewer system) could handle 50 inches of rain over four days. Harris County’s wetlands remain vital for storing and cleaning huge quantities of water during 100-year floods, Jacob said, but he doesn’t want to oversell their usefulness for Hurricane Harvey was such an outlier. He said Harris County’s wetlands and man-made sewers can cope with 100-year floods, meaning an event that has a 1 percent chance of occurring in any given year. Hurricane Harvey’s havoc leans closer to a 500-year or 800-year flood. “What we need to do is stay out of the floodplain and give ourselves a little more extra room,” Jacob said. “If the 100-year floodplain is a mile across, let’s go maybe a quarter mile beyond that, up higher on the landscape. The higher you can get, the more we can elevate our homes, and that will help to keep us safe. Meanwhile, the remaining wetlands still provide $2.4 billion of stormwater detention services for Harris County, which is vital given the frequency of 100-year storms in Houston appears set to increase in the future, Jacob said. 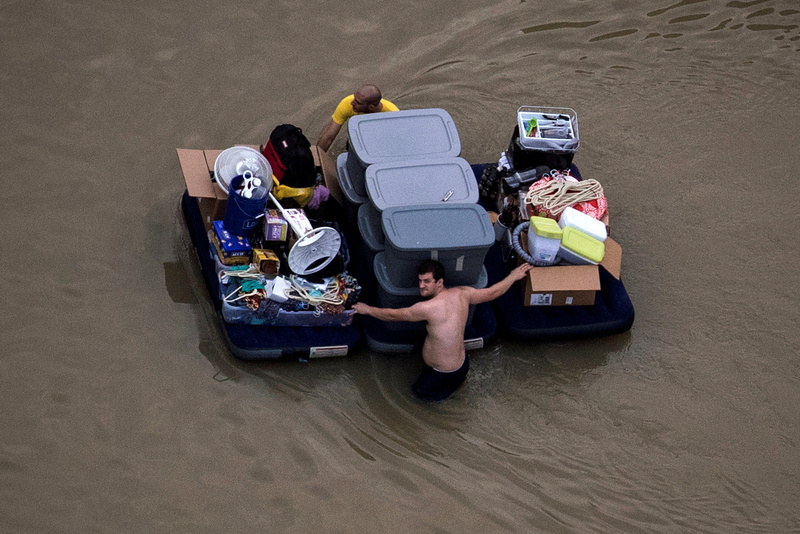 The city already experiences four to five floods per year. Texas lost 52 percent — 8.4 million acres — of its wetlands from 1780 to 1980, which was just 7 percent of what disappeared nationwide. In 2010, the U.S. Army Corps of Engineers created the Engineering with Nature Initiative to create restoration plans for these wetlands and other natural infrastructure under threat. Some of those plans could include reconstructing coastal and freshwater wetlands. Bridges said Narayan’s study aids efforts to make prudent investments in the places that could benefit most from coastal restoration. An Army Corps feasibility study for coastal Texas protection and restoration is underway. It’s scheduled to be released sometime in the spring of 2018, though this timetable may change following Hurricane Harvey, Bridges said. The Army Corps study will include a price tag for these coastal restorations, which can be substantial. Louisiana’s $50 billion coastal protection and restoration master plan aims to reduce damage to land by $150 billion over the next 50 years. But the project is complicated and has experienced costly, billion-dollar setbacks. Are New Orleans’ post-Katrina flood defenses strong enough? William Brangham reports. Editor’s note: An earlier version of this story stated coastal wetlands thwarted $650 million worth of property damage during Hurricane Sandy. The actual figure is $625 million.